Winter over much of the northwestern United States was quite benign for most of December and January, with temperatures only 1.9 degrees Fahrenheit above what was normal for the years 1981 to 2010. By early February, as a consequence of the warm temperatures, mountain snowpack was looking dismal, particularly in Oregon, which had managed to dodge the storm track that delivered respectable precipitation both to Washington state and much of California. Some even started writing off winter as the warm temps began tricking flowers into blooming early. But…then things changed. The month of February and the first half of March reminded everyone that winter was far from over. February delivered an onslaught of relentless cold air across much of the western US and southwestern Canada. Temperatures in Oregon, Washington, and Idaho were 6.4°F below 1981–­­2010 averages, making February 2019 the coldest February since 1989 and the 14th coldest February since 1895. Particularly notable was the persistence of cold temperatures. Seattle, for instance, saw just a single day in February with a high temperature above normal. The first half of March was equally as frigid. Spokane, Washington, had 40 consecutive days with daily temperatures below normal from February 3rd through at least March 15th. Consider the map below, which was created using the Northwest Climate Toolbox, to see what this looked like. During the heart of the cold snap, a large portion of the region experienced its coldest 30-day period for the calendar date since at least 1979. The map reflects this. The map shows color-coded percentiles for the last 30-days for the calendar window February 9th to March 10th—the darker the blue, the colder the temperature. The map shows an awful lot of dark blue. Southern Idaho was the only significant portion of the region that escaped experiencing the coldest February 9th to March 10th temperatures in the last four decades. The exceptionally cold air covered much of the upper Great Plains and southwestern Canada as well. Arctic air plummeting from the north teamed up with progressive flow from the west to facilitate a perfect pattern for widespread snowfall over the last four to six weeks. The Northwest’s rarely snowed-on lower-elevations were hit hard, reminding everyone that snow is both novel and a nuisance for the cities at the lower-elevations. So, how much snow fell at some of the major metropolitan regions of the Northwest? As it happened, a lot. Several cities saw their highest February snowfall total in decades. Seattle, with 20.2 inches, saw its highest February snowfall since at least 1946. Bend, with 20.9 inches, saw its most snow since 1917. And Spokane, with 29.9 inches, saw its most snow since 1893. Snow plows and snow shovels were exhausted. Schools closed. Groceries stores saw the usual frantic clearing of their shelves as the region’s snow-wary residents stocked up for what many thought would be our “snowpocalypse.” However, there was a silver lining to this late winter whiplash. February’s sizable snowfall helped temporarily temper some of the drought concerns across the Northwest. The cold, wet month brought mountain snowpack (where it matters for water resources) to around normal for this time of the year. However, don’t write off discussions of drought for 2019 just yet. Despite the blockbuster snowfalls at the lower-elevations, snowpack in our mountains isn’t anything to write home about. And as we’ve learned in previous years, a healthy looking winter or even late spring snowpack won’t exclude us from ecological drought impacts come summer. In other words, don’t count your snowpack before it melts. You can blame El Niño or that prodigious rodent from Punxsutawney Pennsylvania all you want. Instead, the onslaught of recent cold weather during the latter portion of this winter was linked to a persistent large-scale atmospheric wave pattern across the north Pacific and North America. This past fall, signs portended that a weak-to-moderate El Niño event would develop and favor a warmer-than-normal winter across the region. El Niño never got its act together for proper mid-latitude teleconnections. Or, more precisely, El Niño’s atmospheric counterpart that allows ocean temperatures in the tropical Pacific to influence climate way up here in the Northwest was not on board. Basically, the atmosphere and ocean both came to the dance with two left feet. As an aside, conditions in the tropical atmosphere have gotten onboard in the last month, allowing NOAA to declare a weak El Niño terribly late into the season, which may favor much-welcomed, warmer-than-normal conditions in the coming months for the region. Seasonal forecasts, such as those issued by NOAA’s Climate Prediction Center, have skill (this means they provide better odds than flipping a coin or the witches brew that the Farmers’ Almanac is selling). Nonetheless, sometimes these forecasts are wrong—and for good reasons. The El Niño no show and cold air setting up shop in the West during late winter was likely due to several so-called sub-seasonal factors, including the Madden Julian Oscillation and the breakdown of the stratospheric polar vortex in early 2019. Ongoing efforts by scientists to better understand and model these subseasonal factors will ultimately help us improve outlooks. Does this recent cold snap have anything to do with climate change? The short answer is probably not. Let’s compose this question a bit. Second, it was bitterly cold in the American West in February, but globally not so much. Much of the United Kingdom basked in exceptionally warm temperatures in February, while Australia had its warmest December to February on record—besting the previous warmest summer by a whopping 1.5°F. Third, seasonal temperatures are more variable in winter than other seasons in the Northwest. This is due to the strong jet stream and mid-latitude waves in winter. In addition, cold temperatures are reinforced by the presence of widespread, highly reflective low-elevation snow cover. Some climate researchers now suspect that cold air outbreaks in the mid-latitudes will paradoxically increase with a warming planet. This increase in cold due to warming is itself due to a weakening of the jet stream as the Arctic warms much faster than the lower latitudes in winter. A weakened polar jet stream, it has been argued, allows for more “loopy” atmospheric patterns that could displace cold arctic air masses from the north to the south. This is precisely what we saw in February and what parts of Western Europe and the eastern US have been privy to in recent winters. However, we should note that the research is still being evaluated and is not something that climate models agree upon. What is clear is that our planet’s northern climes are seeing a marked reduction in the extent of extremely cold air masses in winter. In fact, Arctic winter (December to February) temperatures have warmed over three times faster than global temperatures since 1970. What’s more, climate models project that this warming trend will continue in the future. Because the Arctic is the origin, or source region, of the cold air outbreaks that we experience in the Northwest, the disproportional rate of warming in the Arctic and high-latitude landmasses across Canada over the past century means that our cold air outbreaks should be warmer than they used to be. Indeed, the coldest daily temperatures of the year have warmed far-greater than average winter temperatures across the region. While there has been less research done on changes in observed or future snowfall extremes relative to temperature, there is reason to believe that changes in snowfall extremes could be more nuanced. On the one hand, warming leads to higher snow levels and less precipitation falling as snow. On the other hand, precipitation intensity is modeled to increase with climate change. This means snowfall extremes may increase in areas that are sufficiently cold today and that will remain cold enough (and be above the future rising snow line) to capitalize on increased precipitation rates. For instance, one study found that extreme snowfall events are likely to increase in magnitude relative to other snowfall events by the mid 21st century across the western US mountains. Another study found that daily temperatures warm the least during heavy precipitation events under future climate scenarios. While much about extreme snowfall remains up in the air (pun intended), climate change has and will continue to load the dice for certain types of winters. Bet on fewer winters with healthy seasonal snowfall totals in mid-to-lower elevation mountains in the coming decades. Cold months will continue to be more and more scarce—but not necessarily disappear entirely—with continued warming. So, while climate change did not cause the frigid late winter temperatures this year, climate change likely made this winter less cold than it would have been. That may be of little consolation given the last four to six weeks of teeth chattering. But in the long run, this might lead the region to welcome instead of fear the occasional snowpocalypse. 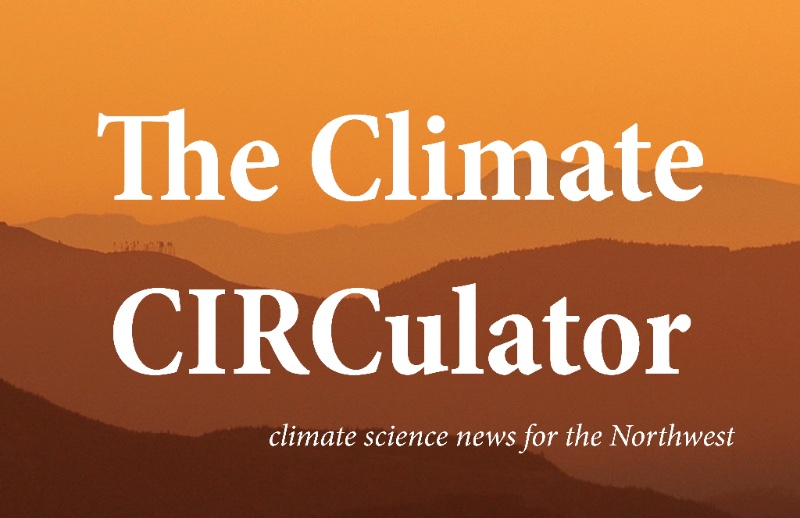 This post is part of Northwest Climate Currents, an ongoing series that uses the Northwest Climate Toolbox and the data it collects to help Northwest residents understand and prepare for the region’s climate events. The Toolbox is a suite of free online applications designed by CIRC researchers and intended to help foresters, farmers, and water managers respond to and prepare for climate variability and change and related impacts. Acknowledgements: The Northwest Climate Toolbox is funded in part through the NOAA Regional Integrated Sciences and Assessments (RISA) program and National Integrated Drought Information System (NIDIS). John Abatzoglou has been a CIRC team member since 2010. A climate and meteorology researcher at the University of Idaho and self-described “weather weenie,” John leads CIRC’s Northwest Climate Toolbox effort. He has participated in the creation of several CIRC-related Climate Tools, including Climate Engine and Integrated Scenarios.